Provides similar output amperage compared to the Rohm chip. Input current in standby (IIH) averages 35μA less. All this lead me to design around the new chip. Of course, breakouts from the usual suspects such as Sparkfun (seen here) and Adafruit (seen here) are available. Adafruit even provides an advanced version which is (in my opinion) over-specialized (see it here). So why did I reinvent the wheel in this case? Because the basic breakout boards are too limited and the advanced version is too limiting. The GPIO pins on the Raspberry Pi are a wonderful thing. They provide so much room for innovation. However, when you only need one or two specific pins, and those pins are scattered all over the GPIO, it is inconvenient and slightly expensive to design a board with the full 26 pin socket. Instead, selective use of 3-pin servo headers can be used at lower cost. The TB6612FNG motor control board I designed uses this type of design. Additionally, there is a problem unique to certain pins of our good ol’ GPIO friend. During boot, pins are not consistently pulled up or down. This can mean that a motor run by these pins may do strange things during boot. If one of those motors is controlling some sort expensive optics as in my case, this is to be avoided. There are a few work around options for this. It is possible to set up a cron job at boot which will set all of the pins to pull up or down, but this may be a challenge to a user with less bash experience. For my project, I need something that allows a user to run the device without worrying about the details. So I implemented a hardware solution. The GPIO pins are pulled down by 100k resistors on my TB6612FNG motor control board. An advanced setting was made available to divorce the chip ground from the motor power ground by way of a solder jumper. 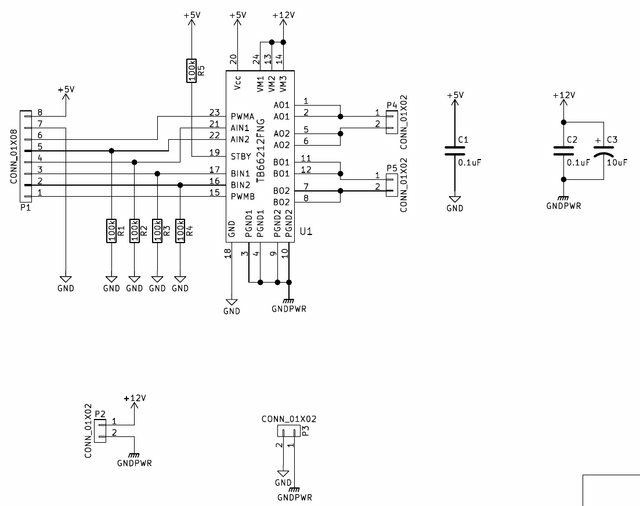 Pictured below is the schematic for my TB6612FNG motor control board. 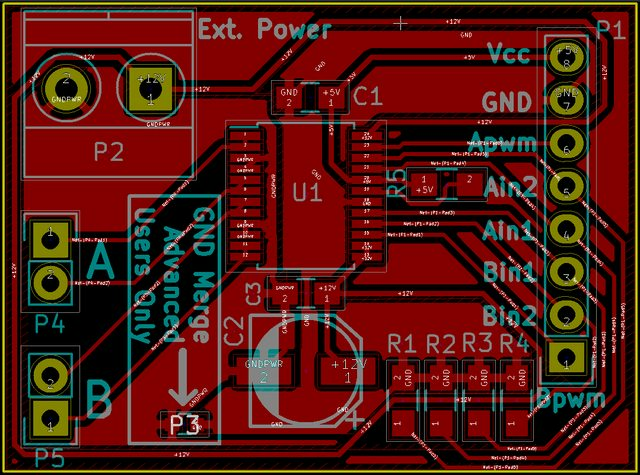 The project was designed with KiCAD. The picture below shows the layout of the board, omitting the back copper plane. I was able to fit all of the traces on one side of the board, so the B.Cu layer is mostly ground plane thermal relief. Next week, I will show how I made the board. 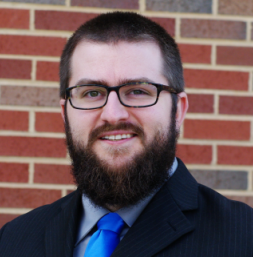 Wesley T. Honeycutt is a PhD Chemist with interests in electronics, CAD, programming, art, and a plethora of other things.